Today I'm sharing the last card I made for the year, and this one went to one of my granddaughters. I used all snippets for this one. The trees are different colors because I used bits of green pieces and punched them with my SU! tree punch (retired). I added some snowy hills done with bits of white and Lawn Fawn stitched hillside dies, along with a SU! Softly Falling ef for the snow. The dot is Playful Pup by Memory Box and the heat-embossed gold sentiment is from a long-retired SU! set, die-cut with MFT stitched circle dies and matted with red, cut with a SB circle die. The trees were adorned with multiple Geo Sparkler stickers and the tops were stars cut from sparkly gold paper and a die from the SU! Perfect Pines framelit set. This card is heading over to the Snippets Playground challenge #342 which will continue for two weeks with prizes being added daily. Click the link above for all the details so you don't miss out! Thanks for stopping by not only today, but for visiting me all year long. Your comments are what encourages me to continue making cards and blogging, and I appreciate each and every one of you who takes the time to stop by and leave some love. Have a wonderful Christmas eve and a very merry and joy-filled Christmas too! These are cute tags. I love that little puppy so muc and he is the perfect size for these trees and tags. Merry Christmas to you! 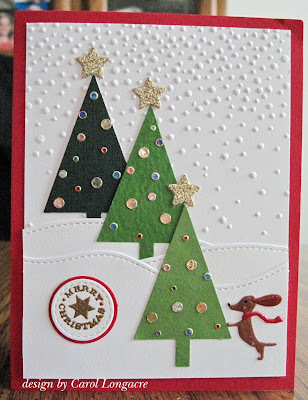 A Beautiful card, love the texture you have with it. Very cute! I'm sure your granddaughter will love it. Merry Christmas, my friend, Hope you have a very special day! You have saved the best for last. Love those trees and the cheeky little pup. wishing you a Happy Christmas and Crafty New Year. Hugs Mrs A. Thanks so much for all your inspirations and your friendship! I wish to you and Butch a Joyful Christmas and a Healthy, Peaceful and Happy New Year! I will replay to your mail as soon as I can! Wonderful card Carol! I adore the teeny pup - and how well you used the tree punch. That's one punch that is rare as hen's teeth nowadays - I certainly wouldn't part with mine!